Imagine, it's your first day on the new job. You're not expecting much but are hoping that the new firm gives you a warmer welcome than your last. (The desk they assigned you came complete with a half-filled cup of curdled coffee, a greasy computer keyboard and a chair with a wobbly leg.) You've been down the on-boarding road before, attended the mandatory and boring orientations and each time you've hoped for a sincere appreciation for committing valuable time, energy, and creativity to the "man". Maybe the "man" should take his cue from an elementary school in Connecticut. On the first day of every school year, this particular school throws a welcoming party for its students. 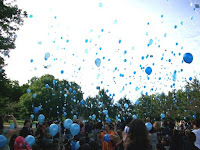 Balloons are released, music is pumped through loud speakers and the teachers meet and greet each and every student. (At one job, I was met with jeers and groans when I offered my hand to my over-stressed new colleagues.) Wouldn't that be something if you were met on your first day at the office with balloons as part of the welcome package? There are businesses that get it right. They do on-boarding really well and I certainly want to know if yours is one of those businesses. Unfortunately, they seem to be the exception not the norm. When the economy turns around and the ratio to hire moves above the unemployment rate, workers will expect a little bit more on their first day than an electric pencil sharpener. No buttocks, no legs, no problem. Except for the food. Meet Jose R. who's missing a body from the waist down. 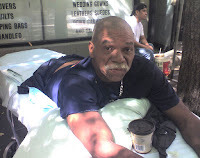 I met him last year on Roosevelt Island where I offered him a "push'. On his permanent gurney, (he can't turn over nor sit up.) Jose wheels himself around the island for exercise and a way to break the tedium of hospital life. I ran into Jose today outside a bodega where he was hoping that some kind soul would buy him a turkey sandwich on rye with mustard and lettuce. I asked him if the hospital where he lives feeds him and he said he can't eat "that stuff" anymore. "I'm sick of it. Would you please buy me a sandwich?" This is the third time we've shared more than salutations and I've never heard Jose complain about anything until now. No legs, no buttocks and all he can find to complain about is institutional food? I don't know but if it were me on that stain soaked gurney I'd have a whole lot more to wail about than beige hospital food. Maybe that's why our paths crossed today. Maybe the Universe or the Grand Station Master heard my pitiful grips and said, 'you think you got problems, check this guy out, again.' It's true, I do need to be reminded from time-to-time. Not often but now and then. We forget sometimes just how good we have it and then a Jose rolls by to snap us out of our mournful abyss. After I gave him a dollar towards his sandwich, Jose said, "Cheer up, it's a beautiful day." Achilles Track Club is looking for walking guides for the NYC Marathon! Looking for guides who are willing to commit to 7.5+ hours. I still need about 5-7 people to assist our early start athletes who will be doing that time and longer. Send in a guide application ASAP to my email. Here is the direct link to the guide application. In addition, Achilles needs volunteers for the NYC Marathon weekend to help at Expo, Start Line, and Finish line. If you are interested or know anyone who may want to help, please email rkoplin@achillesinternational.org Here is the breakdown: Thurs. Oct 29th- Expo 10am-8pm Friday Oct 30th-Expo 10am-8pm Sat Oct 31st -Expo 9am-5pm Sunday Nov 1- ALLL DAY need about 15 volunteers for Start and 50 volunteers for the finish. Hope to see you on the bridge! It's a huge accomplishment for a watch; clocking over three thousand miles in a little over five hundred and thirty hours. Okay, the watch didn't have to do much work, just sit on my wrist as I cranked out the three thousand plus miles. Day-by-day the miles started to add up until Sunday when my Garmin Forerunner's digital face read 3025.78. When started running (again) April 2007 I had no intentions of ever running seriously. That was until the running bug bite and the results started to show. Just like any new skill there was the normal levels of learning progression except, my body, mind and soul was the instrument for which the new skill inhabited. I took on the new (novice) learning with excitement and progressed rapidly (intermediate) which, last week turned into joy (advanced: experience using the new skill for a prolonged period of time). And I would gladly share this new found "joy" with and new learner. With any new learning there are different ways that adults learn and subsequently develop. There are too many learning theories to list here. However, the three basics that must be present for all adults to learn are: (1) because it is important to them; (2) it must be practical: and (3) they need to 'try' out the new learning as in experiencing it for themselves and not be lectured too. Running has enhanced my 'life' in countless ways especially with regards to discipline, creating a plans both short and long term; and being present and in each moment or step of the Journey. I am confident barring being run down by a reckless car driver that I'll be around to see my watch flip over the three thousand, ninety-nine mark to four thousand. The break through with learning something new usually comes when you least expect it. After days or weeks or even months of learning a new skill suddenly, you find yourself using the new skill with greater ease. That was my experience this week. I was doing an interval run workout and when I commanded my legs to turn on the speed I couldn't believe what took place. The ease to which my body responded to the requested effort was an incredible sensation. It was as if a turbo engine was turned on and revved. Wow! Now I want to 'learn' more. Keep studying, keep your eye on the learning and the lesson not just the goal. Learning never ends and the rewards grow in tandem.